The Marvel Cinematic Universe gets its first real taste of magic in Doctor Strange, the 14th movie in their growing collection of superhero movies. And just like the origin stories that came before it, the film manages to both introduce its world and characters, while expanding the overall universe at the same time. The movie wastes no time in establishing its magic-based premise, as it opens with a group of renegade sorcerers, led by the movie's villian, Kaecillius (Mads Mikkelsen), as they steal a few pages from a book of spells owned by a powerful sorceress called The Ancient One (Tilda Swinton). 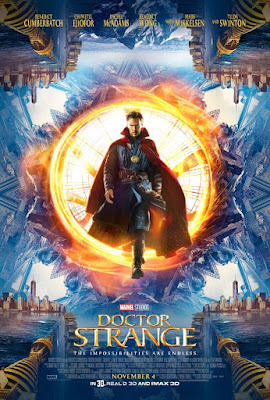 Thereafter, we are introduced to Doctor Stephen Strange (Benedict Cumberbatch), a skilled neurosurgeon with a serious chip on his shoulder, whose world is brought to a grinding halt following a car accident that severely injures his hands and his ability to continue practicing his profession. Having tried all conceivable surgical procedures in an attempt to restore his hands, Doctor Strange turns to Eastern medicine, journeying to Nepal in search of a place called Kamar-Taj, where he'd learnt a paralyzed patient had gotten his ability to walk restored. There he meets Karl Mordo (Chiwetel Ejiofor), one of the Ancient One's students, who takes him to their monastery to be trained in the mystic arts. Soon, Doctor Strange learns that he is not only skilled in the mystic arts, but also destined to play a vital role in the fight against the evil forces that threaten to bring the world to an end. There are many things to love about Doctor Strange, from its fine cast to its effects-laden fight sequences. But what I love the most is how grounded the whole thing felt in the already established MCU, despite introducing the previously unexplored concepts of magic and a multiverse with branching possibilities and timelines. The movie has been compared to others like Inception and The Matrix, and while those comparisons are true, they do no justice to just how mind bending and visually stunning the movie is.